Will the 2014 European elections be only one more of those elections with a low participation rate, 28 national election campaigns and a business as usual result? No, of course not. 2014 will be different. This will be the first time with European issues high on the campaign agenda, parallel to national issues. And the election result will have an even greater impact because the European Parliament will decide after the election who becomes the next President of the European Commission. Additionally populists, right-wing parties and some movements in several EU Member States campaign against the European Union and the European integration itself and some of them can unfortunately hope for a good result in their country. But how can the Greens deal with this difficult situation and defend or even improve on their excellent result from 2009? No we don´t live in the ideal world where voters take some time to find out what the different party positions are and who achieved what in the current legislative period. We live in the real world where one-third of Europeans don´t know any of the EU institutions. Only half of Europeans know that there is a European Parliament. Unbelievable as it sounds, it is one of the results of the Eurobarometer from June 2013. This has a simple consequences for election campaigning: you can´t expect an electorate to know what the role of the European Parliament is and how it works. So you have to develop simple messages so that you and your candidates can explain what the job of an MEP is and why voting Green can make a difference on the European level. Probably the upcoming elections for the European Parliament are the most important event in your campaign calendar this year but for most of the people it´s not. Citizens in those EU Member States that are in an economic crisis are more interested in keeping their job or finding a new one. Very often they don´t expect anything good from politicians and don´t want to vote. And there are the all the clichés about the EU. They are not new, but they are being heard more and more. Of course the EU is not perfect, and especially we Greens want to change a lot, but it´s not the bureaucratic monster as some of the populist parties describe it. Be well prepared and convince with arguments. But don´t make the mistake of accusing a voter of being “Anti-European” if he or she comes up with one of these clichés. The financial and economic crisis in the EU and especially in the Eurozone will dominate 2014. Although you could get the impression that the crisis is over because of a slightly better economic trend than a year ago, the further developments are quite unsafe, the unemployment rates in some EU Member States is still dramatically high and the fiscal debts have not been resolved. All these economic and financial issues are not traditional playing fields for Green parties from the perspective of most voters. Nevertheless the Greens must give a green answer to these problems. In 2009 the European Greens were very successful with the idea of the “Green New Deal” because it focused on the economic problems and presented a way to create new jobs that are more sustainable and at the same time help to fight climate change. This time is no different. The Greens will only be successful if they don´t ignore the economic situation and give a unique answer on how to overcome it. But this doesn´t mean giving up on traditional green issues. Why? Because climate change doesn´t wait and the voters expect Green parties that fight it. And there is one more piece of good news: Europeanwide polls underline that the EU institutions have a high degree of credibility in consumer protection, healthy food or data protection. And all these issues are green issues with a high mobilisation potential among electorate. For decades it was quite easy to be a Europhile. The process of the European integration gave the people safety and hope for a better life. This has changed in recent years and especially since beginning of the financial and economic crisis. Nowadays a lot of European citizens associate fear und unsafety with the EU institutions. Doubtless it seems much easier for the populists, nationalists and anti-Europeans in this upcoming election campaign because they will concentrate on blaming the European Union for everything and will offer so-called simple solutions to the voters like “renationalisation solves all problems”. Do they tell the whole truth? Certainly not. But then it´s time to be offensive and to offer opposition to this argument. And who could do this better than the Greens who believe that transnational problems need transnational (European) solutions. The European Green Party and its national member parties campaign together for the European elections with a common manifesto, a common campaign and common top candidates. 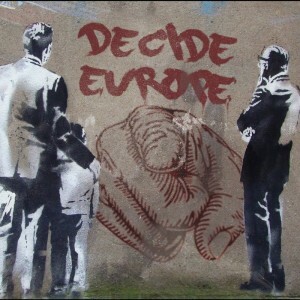 In 2009 only 43 percent of the citizens voted in the European elections. In other words: the party that best mobilises its supporters wins. For that reason don’t focus on the voters of your opponents and instead concentrate on your own. It´s necessary to find out what kind of issues are most important for them and to give green answers to these issues. But you will not mobilise them by detailed concepts and elaborate proposals for new EU legislations. Instead talk about values, goals and why the Greens make a difference. The voters decide later and later if they vote and which party will get their vote. Save money and power for the last days of your campaign. Don´t wait for the media. They are traditionally not really interest in the European elections. Get in direct contact with the voters and focus on face-to-face campaigning. Of course it depends from the political culture in your country but Greens in different EU Member States had good experiences with door-to-door campaigning, for example. Be creative in the web. Creativity doesn´t mean that it´s enough that a party or a green candidate has a Facebook or Twitter account. You have to be an active player and visit the virtual hotspots where you can get in contact with your voters and spread your messages. And you should have the courage to use new trends that are provocative or funny or both like an extraordinary video or a MEME motive. Will everything be different in campaigning in 2014? No, of course not. Perhaps it could be a little bit more difficult than 2009 because traditional “green issues” are not as high on the agenda and Europe is not as popular as in the past. But on the other hand why should Green parties be sceptical? They are the only political movement that takes Europe seriously and have run a common campaign. This is a unique selling point and it makes the Greens strong because they stand united. Author Michael Scharfschwerdt has served for several years at the highest levels of the German Green Party in Berlin and Brussels and currently works as a senior consultant for Joschka Fischer & Company. Coordinator of the German delegation of the Greens in the European Parliament. Until 2007, Michael Scharfschwerdt was the Director of Communications for Bündnis 90/Die Grünen in Germany.